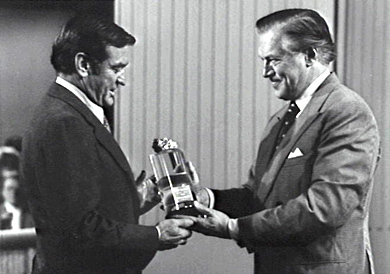 Rod Taylor received several notable honors throughout his career. This roundup of awards starts with a radio prize that launched him toward his career in Hollywood and includes one for his final role in film. This entry was inspired by the photo below. 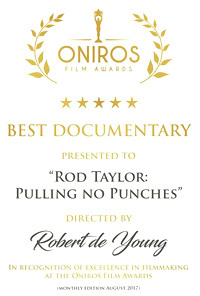 It was taken at Rod's house after the documentary, "Rod Taylor: Pulling No Punches" earned Best Feature Documentary at the Burbank International Film Festival in 2017. It made me curious about some of the trophies pictured. 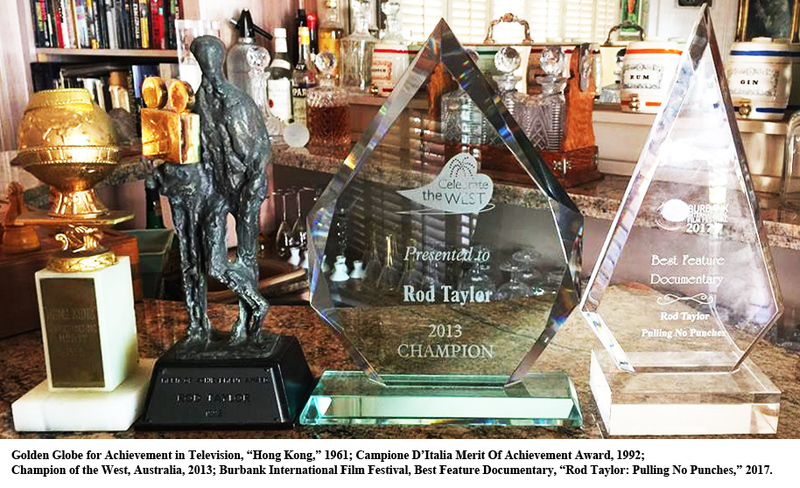 Here's a roundup of Rod's international array of awards. Rod Taylor capped his four-year run as a rising young radio star in Australia with the Rola Award as actor of the year in 1954. "The Rola Show" was a half-hour program featuring local actors in original Australian dramas. After each week's show, listeners nominated an actor who would go into the running for the final prize. On Sept. 13, 1954, Rod won the Rola prize for his performance in the dual role of a father and son in the drama "O'Sullivan's Bay." The prize was £500 and a round-trip ticket to London. He took off from Sydney in November 1954, made a stop in Los Angeles, and that's where he stayed. 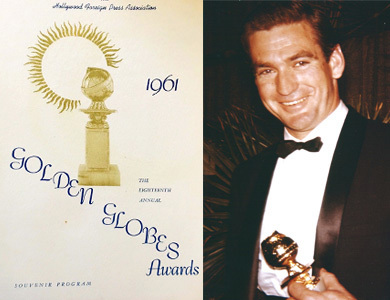 Rod Taylor's TV show, "Hong Kong," scored a special prize for Television Achievement during the 18th Annual Golden Globe Awards. During the awards ceremony on March 16, 1961, "Hong Kong" received a Golden Globe for "Outstanding Merit in the Adventure Field." The Golden Globes are bestowed by the members of the Hollywood Foreign Press Association, recognizing excellence in film and television worldwide. Rod Taylor receives the Chips Rafferty Memorial Award from John McCallum, friend, colleague and award committee member. After wrapping up taping of "The Oregon Trail," Rod returned to Australia for his next prize: the inaugural Chips Rafferty Memorial Award. What he didn't expect was the episode of "This is Your Life" that came with the award presentation! The award was created in honor of Chips Rafferty, a beloved Australian actor whose career began in the 1940s and continued until his death in 1971. Among Rafferty's many credits is Rod's first feature film, "King of the Coral Sea," in 1954. You are here in Australia as the first recipient of the Chips Rafferty Memorial Award. When Chips died, he was planning a trust for an actor or a writer, but he didn't have the opportunity of carrying it through. 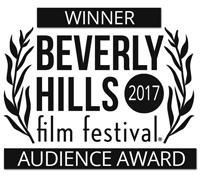 This year a group of close friends established a memorial committee and created an award for achievement in the film industry. This makes me swell with pride to be the first recipient of this kind of award ... I was very fond of Chips and I think he dedicated his life to the Australian film industry. ... I think it's long overdue that we competed with the world market of film. ... There is untapped talent and know-how here and we should kick somebody in the tail and get it moving. 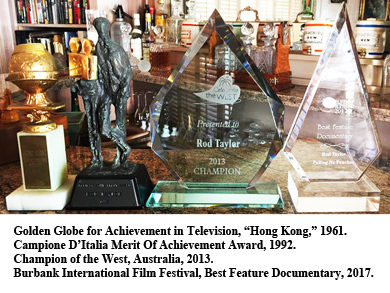 An international star throughout his career, Rod Taylor was among the recipients of the Champions of Italy Merit of Achievement Awards -- "the most unique of international awards," as described by Variety correspondent Army Archerd. In addition to Rod, the 1992 award recipients were Jacqueline Bisset, Ernest Borgnine, Bo Derek, Richard Harris, Janet Leigh, Karl Malden, Valerie Perrine and Katherine Kelly Lang from TV’s "The Bold and the Beautiful," which one writer noted was a national pastime in Italy. 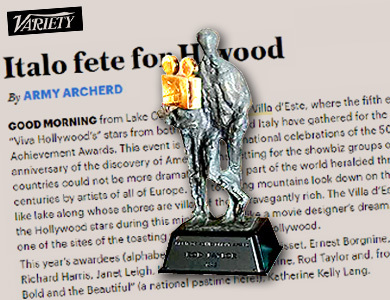 The award ceremony was held on June 19, 1992, in conjunction with the fifth annual "Viva Hollywood" celebration at the Villa Erba at Lake Como. The gala event honored Hollywood stars and recognized the work of Italians in Hollywood. Rod's Italian connections include working in Italy for "Seven Seas to Calais" (1962) and appearing in Italian director Michelangelo Antonioni's "Zabriskie Point" (1970). Rod Taylor's final movie role was as Winston Churchill in "Inglourious Basterds" (2009). He was part of a cast that won several awards for best ensemble. The biggest of these honors came from the Screen Actors Guild. SAG saves the best for last at its awards ceremony, and on Jan. 23, 2010, "Basterds" won the prize for Outstanding Performance by a Cast in a Motion Picture. Director Quentin Tarantino assembled an eclectic international cast for his revisionist World War II tale, and he purposely sought out Rod to be a part of it all. Rod Taylor grew up in Lidcombe, a working class suburb west of Sydney, Australia. Almost a generation later, actor Bryan Brown also grew up a "Westie," and he has expressed his admiration for the example that Rod provided. During an interview for "Rod Taylor: Pulling No Punches," Brown said, "To think that a Lidcombe bloke, 15 years before me, went 'I'll think I'll go to Hollywood. I think I'll become an actor. On the big screen.' You sort of go, 'Mate, good on ya!'" 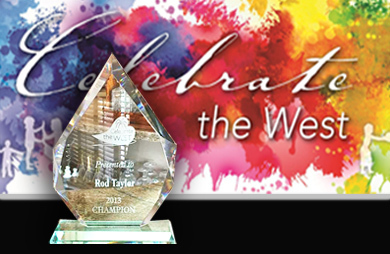 Each year, Brown serves as the emcee for the annual Celebrate the West awards, which pay tribute to prominent figures from Greater Western Sydney. The event gives the honorees an opportunity to share their stories and inspire others. As a young bloke growing up, the last thing you could ever think about was being an actor. ... I mean, on my street growing up, I didn't even know anyone who went to university. These sort of things were for people from other areas or people from overseas. But the thing is, whatever degree of success you achieve, there was always someone who's been before you and there's always someone who comes after. And the ones that come before you are often the ones that say to you, "It can be done." 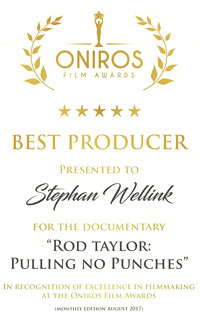 Rod Taylor has made an outstanding contribution to the arts through his acting career and has furthered the rich tapestry of the Western Suburbs through his dedication to furthering the profile and caliber of Australian films and Australian actors. ... I spoke to Rod in Los Angeles a couple of weeks ago and ... he loved the fact that he was going to get this award. He loved the fact that he was a Westie. The theme of people helping others is in keeping with the fact that the annual awards ceremony also is a fund-raiser for the San Miguel Family Centre, a non-profit organization in New South Wales that offers accommodation and support for young families experiencing homelessness to help them get back on their feet. In addition to Rod, the 2013 honorees included Olympic medalist Jessica Fox; businessman and philanthropist Bill Moss; David Liddiard, an advocate of Indigenous Australians; rugby legend Tom Raudonikis; Margot Zaska, a leader in providing sporting opportunities for the disabled; and John and Jan Gollan, supporters of the San Miguel Family Centre.